"Christ shows by casting out a legion of demons by his word alone that his heavenly power was appointed to deliver men from the slavery of the devil: but foolish men for the most part will not redeem this so excellent grace freely offered unto them if it means the loss of even the least of their wealth." "Those under Christ's government are sweetly led with the bands of love; those under the devil's government are furiously driven. Oh what a comfort it is to the believer, that all the powers of darkness are under the control of the Lord Jesus!" "Not that they were any easier in the swine than out of them. Had it been so, they would not so soon have dislodged themselves, by destroying the herd." Sitting at the Feet of Jesus, from The Poor Man's Portions, Robert Hawker, c. 1800. Commentary, Luke 8:26-39 (Pentecost 5C), Lucy Lind Hogan, Preaching This Week, WorkingPreacher.org, 2016. "Groucho Marx once famously observed that he would never want to be a part of a club that would accept him as a member." "God in the Shadow Lands," David Lose, ...in the meantime, 2016. The Truett Pulpit, Stacey Simpson Duke, Co-Pastor, First Baptist Church, Ann Arbor, Michigan, 2016. "A Provocation," Richard Swanson, Provoking the Gospel, 2016. "A Man in his right mind," Robert Warren, Christ Church Clermont-Ferrand, 2016. "Name Your Demons," David F. Sellery, 2016. "Living in the Tombs," Melissa Bane Sevier, Contemplative Viewfinder, 2016. "Broken Chains," Alan Brehm, The Waking Dreamer. "The real source of freedom from the evil and pain and trauma and injustice that binds people in our world today is the power of God's kingdom at work among us and through us"
"No longer possessed by the mob," Andrew Prior, 2016. "On Pigs and Sacrifice and Foreshadowing..." Janet H. Hunt, Dancing with the Word, 2016. "I Am Legion," Andrew King, A poetic kind of place, 2016. Commentary, Luke 8:26-39 (Pentecost 5C), Michael Rogness, Preaching This Week, WorkingPreacher.org, 2013. "Gospel stories of demon possession are difficult to preach, because we don't experience demons as described in the Bible." "The heartbreaking moment in the story for me is when Jesus asks the man his name and one of the horde answers, "Legion, for we are many." I find it devastating that he has no name, no identity left, except for what he is captive to." "Unbinding the Unbindable Bound Man," D Mark Davis, Left Behind and Loving It, 2013.
" As in many stories of persons who have a demon, the pronouns are hard to keep separate. In the phrase "He said" the 'he' is Legion. In the phrase "into him" the 'him' is the man, not Legion. It is not a linguistic problem, it is the problem of identity with anyone who has a demon. Who am I? Who am I apart from or in cohesion with this demon? Can 'I' be separated from 'it'?" The Politics of Luke 8:26-39, Amy Allen, Political Theology, 2013. "In any time, in any place, there are demons to fear. There are those things and people and ideas that we prefer to keep in shackles and under guard. But they have an annoying tendency of breaking loose." "Fear and Wisdom in the Immigration Debate," Raj Nadella, Odyssey Networks ON Scripture, 2013. "When the people see the 'demon-possessed' person fully clothed, in his right mind and at the feet of Jesus (back in the city), they are afraid." "My Name is Legion, What's Yours?" Alyce M. McKenzie, Edgy Exegesis, 2013. "Exorcism and God's Victory over Oppression." Demons and Us, Anne Howard, The Beatitudes Society, 2013. "How do we respond to the possibility of healing in our lives, our institutions, our communities: do we choose to hold fast to the old ways, or do we step forward into liberation?" "Is It Time to Talk about Mental Illness?" Beth Scibienski, A Thousand Years of Inspiration, 2013. "Perhaps this is the week to begin an honest conversation about mental illness and the love of God." "Seeing Ourselves in the Gerasene Demoniac," Pentecost 5, Daniel B. Clendenin, The Journey with Jesus: Notes to Myself, Journey with Jesus Foundation, 2013. "Begging Jesus," Nanette Sawyer, The Hardest Question, 2013. "Are we the demons Jesus has to negotiate with so that we might stop creating suffering in the world?" Holy Textures, Understanding the Bible in its own time and in ours, Luke 8:26-39, David Ewart, 2013. "The name 'Legion' has a double meaning. Literally, it means, 'Many, thousands, multitudes.' But it also alludes to the occupying Roman soldier legions which numbered 3,000 to 6,000 each. Many Israelites felt the Roman legions were another form of demonic occupation." Breaking the Bonds of Fear, Rick Morley, 2013. "Sometimes people learn to love their chains." "What God Has Done: The Man No Longer Possessed by Demons," Janet Hunt, Dancing with the Word, 2013. "When you hear about the chains and shackles and the 'living n the tombs' in this story, where do you see people doing this today? Where and how have you experienced this yourself? While I speak only of mental illness above, it is also the known experience of those struggling with all kinds of challenges." "Washing Pigs!" Thomas Beam, 2013. Commentary, Luke 8:26-39 (Pentecost 4C), Sarah Henrich, Preaching This Week, WorkingPreacher.org, 2010. "Recalling a relatively recent movie, we could call this study 'Four miracles and a sending.'" The Lectionary Lab, Pentecost +5, the Rev'ds Dr. John Fairless and Delmer Chilton (aka "Two Bubbas and a Bible"), 2013. Lectionary Lab Live podcast. "First Thoughts on Year C Gospel Passages in the Lectionary: Pentecost5," William Loader, Murdoch University, Uniting Church in Australia. "Luke 8:22-25 tells how Jesus stilled the storm. Our passage is equally dramatic: Jesus defeats the powers of the abyss. These are celebrations of power against power." "It could also be a time to stress that Christianity is more than just coming to church to receive from Jesus, to praise God in community, but it also involves returning to the world and declaring our experiences with God -- a world that may not always have been kind to us." "'Proclaim' is the stronger word, and had an important meaning in the early church. 'Proclaim' is what you did with the 'good news.' Thus, though the man may not accompany Jesus, he is given an important gospel-proclaiming mission in his own context, that of his gentile city, his relationship to which has been healed and restored." Jesus Heals the Gerasene Demoniac, audio telling, story in episodes, graphic, audio and written commentaries. Go Tell Communications, Biblical Storytelling for the Global Village, 2010. "Gadarene Demoniacs," Gospel Analysis, Sermons from Seattle, Pastor Edward F. Markquart, Grace Lutheran Church, Seattle, Washington. Detailed background and exegesis. "Living in the first century, we may have focused on the demons and the pigs. Living in the twenty-first century, we focus on our own examples of healings and the invitation to share ?our story? with family, friends and neighbors how God/the Lord/Jesus has healed us." "Healing a Gentile Demoniac," Rev. Bryan Findlayson, Lectionary Bible Studies and Sermons, Pumpkin Cottage Ministry Resources. Includes detailed textual notes. Anderson, Mary W., "Stay and Follow," The Christian Century, 1998. Arnold, Clinton E., "Exorcism 101:What Can We Learn from the Way Jesus Cast out Demons?" Christianity Today, 2001. Craghan, John F., "The Gerasene Demoniac," The Catholic Biblical Quarterly, 1968. Derrett, J. Duncan M., "Contributions to the Study of the Gerasene Demoniac," Journal for the Study of the New Testament, 1979. Harstine, Stanley, "An Exegesis of the Character of Jesus in Luke 8," Review & Expositor, 2000. Hollenbach, Paul W., "Jesus, Demoniacs, and Public Authorities: A Socio-Historical Study," Journal of the American Academy of Religion, 1981. Karris, Robert J., "Bonaventure and Talbert on Luke 8:26-39: Christology, Discipleship, and Evangelization," Perspectives in Religious Studies, 2001. Kleist, James A., "The Gadarene Demoniacs," The Catholic Biblical Quarterly, 1947. "The Cost of Healing," Rev. Luke A. Powery, Duke University Chapel, 2013. "Modern Demons: Depressed and Dysfunctional," Edward F. Markquart, Sermons from Seattle. "When Jesus Comes to Visit," the Rev. James T. Moor, Day 1, 2007. "Identifying with the Scapegoats," Pentecost +4, 24 June 2007, David Zersen, Goettinger Predigten: Every Sunday Sermons based on the RCL by a team of Lutheran theologians/ pastors. "Sermon for the 12th Sunday in Ordinary Time," the Very Rev. Todd Donatelli, Day 1, 2001. "Jesus Sends a Man's Demons into a Herd of Swine," Sunday School Lessons: Family Bible Study, art projects, music, stories, etc. Luke 8:39, memory verse activity, MSSS Crafts and Resources for Bible Stories. Clip Art Images: Luke 8:26-39, Luke 8:26-39 #2, Misioneros Del Sagrado Corazón en el Perú. 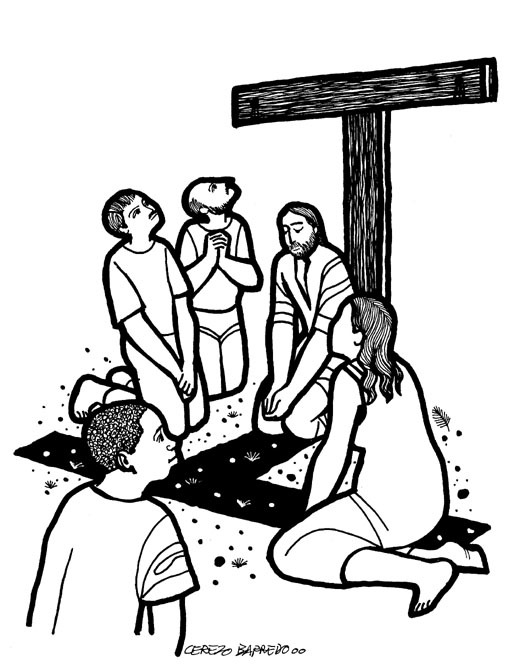 Luke 8:26-39 at Cerezo Barredo's weekly gospel illustration. Liberation emphasis. "One Day as Jesus Traveled," Carolyn Winfrey Gillette's hymn based Jesus healing the man with demons in Gerasene. Tune: LLANGLOFFAN 7.6.7.6 D ("Lead On, O King Eternal") or AURELIA ("The Church's One Foundation").